Global warming has spawned a call for new dams — but there may not be any water to fill them. The dream of the infinitely expanding West is getting beaten over the head with an empty bucket. Flows in the Colorado River, which is now entering its eighth straight year of drought, will be less than half of average this year. 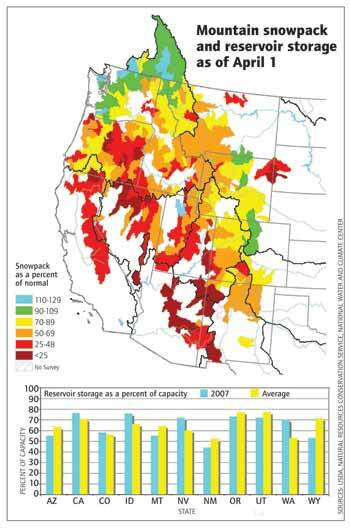 In the Sierra Nevada, snowpack is just 46 percent of normal. And those numbers are likely to get even worse in the future, as droughts are amplified by global warming. Indeed, global warming is already changing the West’s waterscape. Average temperatures in the region have increased by about 2 degrees Fahrenheit since the 1970s. A greater portion of each year’s precipitation is falling as rain rather than snow, and snowpack — which serves as a natural, slow-release reservoir — is melting earlier than it used to; both changes are intensifying the pulse of winter and spring runoff. New dams can catch excess bursts of water when they come out of the mountains, then spread those flows throughout the year. But it is becoming clearer that, for the West as a whole, more dams may not stem future water crises. New climate projections are hinting that in the future, the region won’t just be warmer. It will also be drier. Any effort to build more dams will be shadowed by the curse of diminishing returns. For one thing, there simply aren’t many places left to put a dam, either in California or in the West as a whole. One of the two proposed California dams would be built at Temperance Flat, in the Sierra foothills near Fresno, to catch floodwater in the San Joaquin River. Yet possible dam sites are so limited that the dam would have to be built in an existing reservoir called Millerton Lake. The second, Sites Reservoir, would be built in the hills on the western edge of the Sacramento Valley, and would hold water from the Sacramento River. A very big question lurks behind the new-reservoir endeavor: While the dams are being pitched as part of a strategy to increase the reliability of California’s water supply, the reliability of the river flows needed to fill the new reservoirs is far from clear. In the case of Temperance Flat, for example, flow data from the past 57 years indicate that a dam could catch a considerable amount of water. In the years since, an increasing number of scientists have focused their efforts on climate change, largely in support of the most recent Intergovernmental Panel on Climate Change assessment, released this spring. “It’s still unsettled,” says Dettinger, “but as people have tinkered with their models and made the models better, there’s been a general drift to it getting drier” in California, and in the Colorado River Basin.